The rest of the afternoon passed slowly, interminably. Now I know how the dame in that Egyptian Opera felt. Aida, that's the one. She falls for the wrong guy and gets buried alive for her trouble. ....The problem with the nurse ruse was that people expected me to keep close to the patient. I guess, to be honest, Evadne did bear watching. She might not be technically batty, but she was hovering too close for comfort. Watching her drift around the silver and pink boudoir, gazing out the window, and periodically heaving heartfelt sighs, I felt sorry for the kid when (and if) it finally made its bow. ....Eventually a maid rolled in a little cart and we were served tea and sandwiches made from things that are generally found in vases or centerpieces. To encourage Evadne, I tucked in. She picked and poked at the crustless triangles. I thought she needed a good steak and something new to think about. ...."So what's the story on the princess?" I asked. 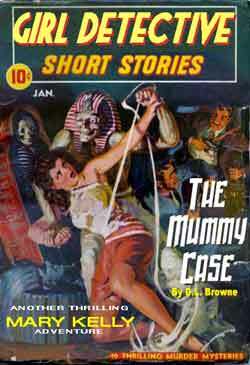 ....She gave me the story on the princess, and I was surprised to learn that Evadne had actually been on site when the mummy's tomb had been discovered. So much for appearances. Evadne might look like she had never wandered farther east than Grauman's Egyptian, but she had been a working member of the archeological team that included her husband, father, father-in-law, brother-in-law and numerous other experts I'd never heard of. In a few minutes I learned more than I needed or wanted to know about Egyptology. When I could distract her from fond memories of pottery shards and hieroglyphs, I said, "I guess a find like that is worth a pretty penny. I read in the papers that someone tried to steal it. Her." ....She gave me a reproachful look, and I shrugged. I guess it was a tactless question, but you don't get paid for being tactful in my business. ...."They should never have brought that thing into this house. It's cursed. Unclean." ...."Spiritually unclean. Cursed. Defiled." She seemed to be working herself up again. I wondered if some antique germ-carrying beetle or something had bit her while she was tooling around the pyramids. ...."You mean like... um... King Tut's tomb?" ....I tried again. "So what was she? Some ancient priestess?" ....The blue orbs flashed at my ignorance. "She was a Fourth Dynasty princess. The favorite child of Cheops. Surely you've heard of Cheops?" ...."Inyotef ruled briefly but wanted to abdicate when she fell in love with a commoner, an architect. We don't know his name. It's been erased from the sacred texts." ....I had a feeling I knew what was coming. "I take it Inyotef and the architect didn't live happily ever after?" ...."The high priests had her poisoned." ....Typical. You'd think after a few thousand years of this stuff people would get wise, but nope. Edward VIII had gotten off easy. ...."So much for early retirement. Where does the curse come in?" ...."Inyotef's lover had her body stolen and hidden in a secret tomb guarded by spells and a powerful curse." ...."And sealed with a kiss?" ....She was unamused. I could see by the sudden flush of color in her face that this secret burial jazz appealed to her. Maybe the whole idea of tragic death appealed to her. I felt uneasy studying her. ...."The curse reads that who so shall ever disturb the rest of Inyotef shall be visited by awful death. They and all their house." She rested a protective hand on the swell of her tummy. ...."I feel the same way when I don't get my eight hours," I said. ....I was just hoping to lighten the mood, but she gave me a withering kind of look, and I knew it was a lost cause. Apparently this clan took its dead souvenirs seriously. ...."Come on, Evadne. You're an educated woman. A woman of science. You don't really believe that stuff?" It didn't occur to me 'til later that maybe this wasn't the way a real live nurse would address her charge. ....Evadne dropped her face in her hands and the red hair spilled over her fingers like liquid fire. She said muffledly, "You don't know. How can you? My father was the first man into the inner chamber, and he was dead before we left Cairo. I'm next. I can feel it. I can feel the evil reaching out for me"
....Speaking of reaching out, I'd have liked to reach out and strangle Brannigan about then. Why hadn't he filled me in on this little detail? ...."It's all coming true," she wailed. "You saw my poor little birds. And my flowers. Every time they bring me fresh flowers, they die! I'm not imagining it. You can ask Gloria. She saw it happen once, although she doesn't want to admit it. They're all afraid to admit it." ....Feebly, I inquired, "Who's Gloria?" ...."A friend of the family. And then there's that strange man with the limp who keeps hanging around the estate." ....Well, there would have to be, wouldn't there? ....She looked up finally, her eyes meeting mine, exclaiming, "And Jones!" ...."He saw it. He knew what was happening." ....Even dead he had the advantage over me. ...."Um, tell me about Jones," I suggested. ...."He wasmy friend. That's why he's dead." ....Why the hesitation before the word 'friend'? Had Jones butled where he had no business? ...."Jones is dead because someone shot him," I said bluntly. "Granted I'm no expert, but that doesn't sound like the way a mummy operates, to me. Do you think the robbery attempt was part of the curse?" ....Her eyes narrowed and she surprised me by banging a small fist on the table. The teacups jumped. ...."Huh? Who said you were?" ...."You think it! I can see it in your eyes. Everyone thinks it. David thinks it. I'm trying to protect my unborn child and people think I'm mad." ....And so it went. I soothed her to the best of my ability, but from that point on I couldn't get anything useful from her. Late afternoon the wind picked up again, moaning outside the windows and whispering at the casements. ....Just as I was thinking that if I had to spend another minute in that room I would go crazy, Evadne snapped out of it. Sort of. ...."You must be bored to death, Nurse," she murmured, falling back into that soft monotone that made me want to scream. "Why don't you take a walk before dinner? The grounds are lovely. I'm going to take a nap." ...."Thanks," I said. "I think I will." ....I blew out without further adieu. ....The grounds were lovely, and as I wandered around that evening I got a clearer idea of the layout of house and gardens. And the more I thought it out, the less likely seemed the robbery theory. I could only imagine what Mr. B. would say if I told him our prime suspect was some bloke from the British museum. I had already taken enough ribbing over my last case, which had involved blackmail and murder in Chinatown. It took Brannigan nearly six months to trust me on my own again.